Joe Procopio is a master musician and teacher with proven success for over 50 years. His purpose in writing ebooks is to make his successful method of teaching and making musicians available to as many people as possible around the world. teacher Of Guitarist T. Maxwell heard in TV’s Magnum P.I., The Rockford Files and Kojak. 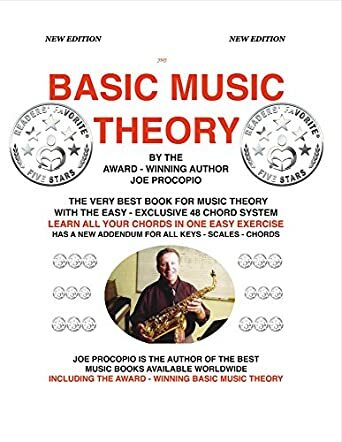 Basic Music Theory by Joe Procopio introduces readers to the concepts of music theory and music structure, starting with the very basics. This simple, but exceptionally easy to understand guide assists interested readers in learning the contents within keys, scales, intervals, chords, and chord extensions. The author provides readers with easily read and understood concepts, a simple layout, formatted pages, and a full introduction to the basics of music. A beginner music learner can easily become comfortable studying Basic Music Theory. The author starts with the very basics of reading and understanding an entire sheet of music, by giving a great explanation of what each particular item is and its purpose. For example: the music staff and everything involved with it; the treble clef, bar line, time signature, double bar lines, and measures. As the reader progresses in studying the book, Joe offers practice exercises with included answers. As the book comes to an end, the author provides readers with advice on how to play the measures with exercises specifically for different kinds of instruments. Not having much knowledge and understanding of music theory and structure prior to reading this book, I can confidently state I grasped the concepts being introduced, and gained exceptional knowledge on how to properly build scales, and learned the names for intervals and chords, and how they relate to one another. Joe Procopio has created a wonderful book chock full of valuable study information for anyone interested in learning about music, music theory, and music structure. Having read Michelle Robertson’s review of BASIC MUSIC THEORY and knowing the book as its author, I can safely say that Michelle’s review is right on target. She hit the nail on the head when she said although she is not a musician she “grasped all the concepts” of music quickly and easily. That is precisely the purpose of the book. After teaching music successfully for over 50 years, I can say with certainty that BASIC MUSIC THEORY is the very best and lowest priced music theory book available on the market worldwide.